Daily from 10am to 5pm, Closed on Wednesdays. National Express 508 from London, many local buses. Tenby station is 5 minutes walk. 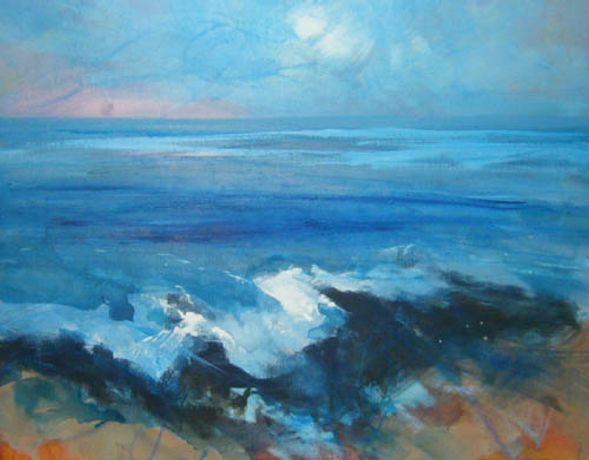 Energy and excitement: Penny Timmis exhibits in Tenby Incredibly, for a widowed dairy farmer with four children, Penny Timmis is a now also a prolific and successful artist. She has produced more than 40 new paintings for her exhibition in Tenby in June, her fourth solo show at the White Lion Street Gallery. Energy is conveyed in every brushstroke, with flourishes of paint added straight from the tube. Light-filled landscapes have depth and a sense of recognisable place but also excitement in the use of both colour and mark. Restless water and crashing waves contrast with distances of sea and calm beaches. Penny often uses colour at full strength, mitigated by softer more muted washes, sometimes adding collages of torn paper or delineating her subject. Foreground rocks may be red against light turquoise seas and bright yellow-lit grasses emerge from the indigo shadows of woodland. Pembrokeshire provides the stimulus for much of the work: with family in Manorbier, Penny is a frequent visitor and her coast walks, between St Davids and Saundersfoot, give her the opportunity for quick sketches along the way. These she refers to when back in her Shropshire studio. Amongst the land and seascapes are paintings with subjects closer to home and the farmyard  a gaggle of geese, imperious cockerels and docile cows. Penny's work is shown in prestigious galleries across the UK and at The Affordable Art Fairs of London and Bristol. She has become an elected member of the Royal Birmingham Society of Artists and of the Society of Woman Artists. Her large exuberant flower paintings were shown at Hampton Court Flower Show last year and some similar will be exhibited in this latest exhibition. The exhibition âNew paintings by Penny Timmis' will show at The White Lion Street Gallery from 1st to 28th June. The gallery is open from 10am to 5pm every day except for Wednesdays throughout the summer and everyone is welcome. For more information telephone 01834-843375 or view the website: www.artmatters.org.uk.